Physical oceanographer Amy Bower is currently en route to the Labrador Sea to install a deep-water mooring that will monitor ocean currents in the far North Atlantic Ocean. Growing up on Cape Ann, Massachusetts, just yards from the sea, she was at home in and fascinated by the natural world. Later, in graduate school at the University of Rhode Island, she began to experience problems with her vision, followed by a diagnosis of macular degeneration—a progressive eye disease resulting in loss of central vision. Legally blind for 14 years, Amy uses adaptive technologies such as text reading and magnification software to pursue both a research career—including more than a dozen research cruises, dodging hurricanes in the Atlantic, and modern-day pirates in the Indian Ocean—and a life outside of work in which she skis, sails, and promotes activities for the visually impaired community. In 2003, she was named Blind Employee of the Year in Massachusetts by the Carroll Center for the Blind in Newton, Mass. Her current cruise incorporates an innovative outreach project with students and teachers at Perkins School for the Blind in Watertown, Mass. You set out on an expedition on Sept. 19. Tell us about it. We’re steaming toward Greenland, through the Labrador Sea in the North Atlantic, to deploy a mooring in a part of the ocean where something interesting happens. The mooring is anchored to the seafloor and is equipped with sensors on a line rising toward the surface. It will be strategically placed in the path of warm eddies that are shed from the coast of Greenland and drift into the Labrador Sea. What’s an eddy and why are they important? An eddy is a mass of water of one temperature that breaks off from a current, spinning in a circle, and drifts intact through waters of a different temperature. Eddies can maintain their integrity for long distances—in this case, carrying cargoes of warm water from a warm current flowing around Greenland into the cold Labrador Sea. We know very little about these eddies, but we think they play an important role in the circulation of the Labrador Sea, and perhaps the whole Atlantic Ocean. It sounds like these masses of water have a lot of influence on the ocean. How do they work? Well, they are small cogs in a big wheel—a big turning wheel, which is sometimes called the ocean conveyor belt, or thermohaline circulation. It is like a big radiator: The oceans get heated near the equator and flow toward the poles, where they’re cooled and get dense and sink, and then flow back toward the equator. The oceans’ circulation distributes heat around the planet and helps regulate Earth’s climate. Some of the cooling and sinking takes place in the Labrador Sea. Every winter, its waters are cooled a lot by frigid Canadian winds that blow over the sea, and the summer sun doesn’t restore all of that lost heat. So the heat that is removed has to be replaced somehow, because otherwise the waters would just get colder and colder and colder—and we know from long-term measurements that this is not happening. We think some of the heat comes from these eddies. What do you want to find out about the eddies? We don’t know how many eddies form, or how much they warm the sea up again after winter’s cooling. If the sea is warmed up a lot, then it’ll take longer to cool again in the next winter. If there are no eddies and it doesn’t warm it up at all, then it’s going to get even colder the next winter. Either scenario has implications for ocean circulation—and climate. How much impact, we don’t really know. This is one discovery step in figuring that out, starting with very little information. The questions we are attacking in this project are: Do eddies get from the Greenland coast to the Labrador Sea interior intact? If so, how much heat do they still contain when they get there? How will the mooring help answer your questions? In two ways: First, the mooring goes from the bottom, at 3000 meters, up to 100 meters from the surface. 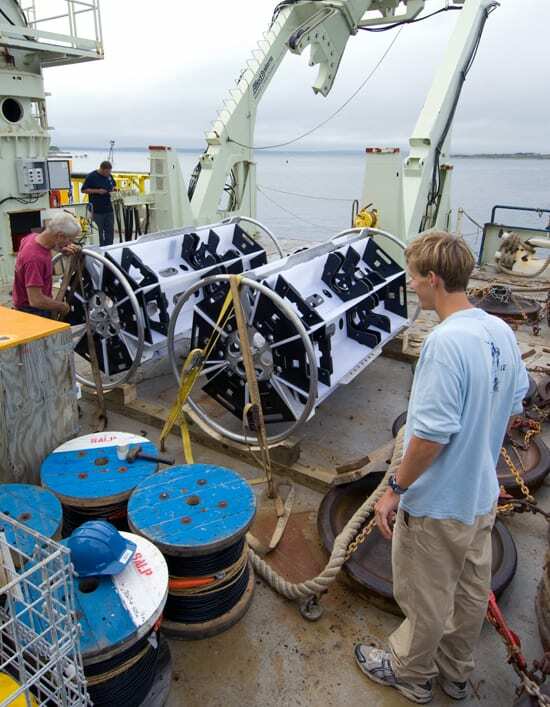 It will have instruments all the way along it to continuously measure currents, temperature, and salinity. And as each eddy goes by the mooring the instruments will detect it. We are placing the mooring right near where the eddies pinch off from the warm current, and hopefully, the eddies will march along, right over the mooring. The mooring will be in place for two winters, because these eddies form mostly in the winter—for reasons we don’t understand. What’s the second way the mooring will help answer questions? The second part is more innovative—and risky! The mooring will have two cages, or carousels, each with six “profiling” floats. 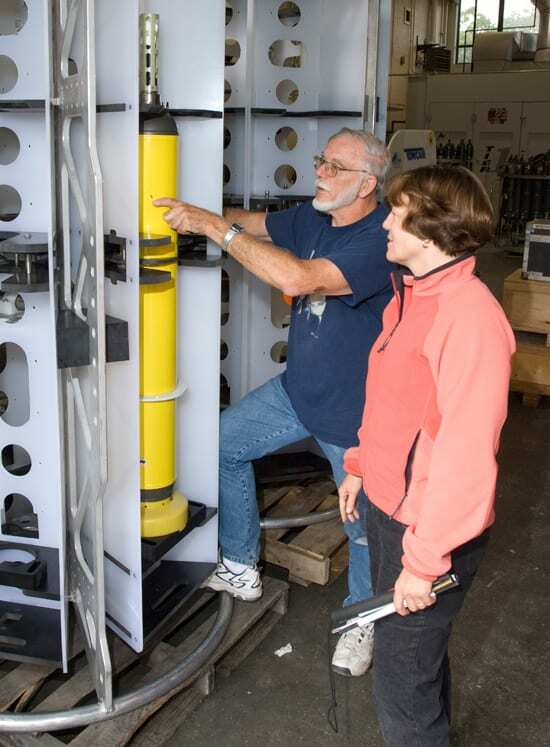 When an eddy comes by, the carousel’s sensors will detect the warm water coming by the mooring, and it will release one float into the eddy, without any command from scientists ashore. The floats repeatedly sink to a pre-set depth and then rise to the surface, measuring water temperature and salinity along the way. Each time they surface, they will call up a computer at WHOI and say, “I’m here! I’m here!” and transmit their collected data via satellite. Each float will drift with its eddy and travel up and down, measuring in the core of the eddy until the eddy eventually disperses. This method of releasing floats is very new, so it might not work. There is that possibility—hopefully, it’s a small possibility! But if the floats fail, we have, as backup, the mooring with its sensors, which is reliable technology that we’ve been using for a long time. It should provide useful new information about eddies, from the very beginning of their lives soon after they form. Your enthusiasm for your field and this project is infectious. Where does your passion for science come from? Being a scientist allows me to learn answers for myself, to satisfy this basic curiosity that is just in me about everything in the natural world. This is a silly example, but my husband David and I were driving along a marsh this morning, and David said, “Wow, look, there are thousands of birds there—it’s just black with birds!” And I said “Oh! What kind of birds? How many? What are they doing?” I just suddenly wanted to know everything about these birds. My mom is that way, very inquisitive, and a big fan of author Rachel Carson (most famous for her book Silent Spring). My mom bought and read me Carson’s book A Sense of Wonder, in which she asks parents to take their children outdoors and introduce them to the wonder and variety of nature. I can only imagine that those things had a big impact on me, and it became part of my being. Now, you could be curious about a lot of things—math or music or something else—but I think growing up with an emphasis on the natural world steered me in that direction. Also, I think problem-solving and figuring things out, even at a less grandiose level, is just fun and exciting to me and fuels the fire to keep doing this work. How have you adapted to your vision impairment, especially for work at sea? 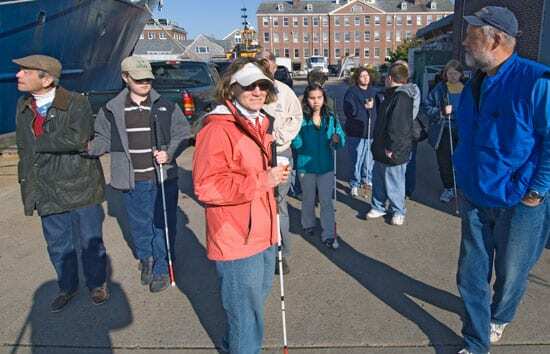 To get around at WHOI, I use a white cane so that I don’t trip over anything that’s been left in the hallways. I’ve been legally blind for 14 years. That means I still have some vision, but not enough to drive a car or recognize faces or spot a “wet floor” sign left out by the janitors. I transport everything to sea that I use in my office. I take my laptop, which has two pieces of software I use extensively: a screen reader, which reads everything I type or point at on the screen, and screen magnification software that makes everything bigger. I can also plug right into the ship’s network. A lot of the data the ship collects now is streamed over that network, so I have immediate access to all that. I have a new device with a down-looking digital camera. It takes a picture of anything printed, converts it to text, and reads it, in 5 to 10 seconds. So if the captain hands me printed material I have to read, that is what I would use. 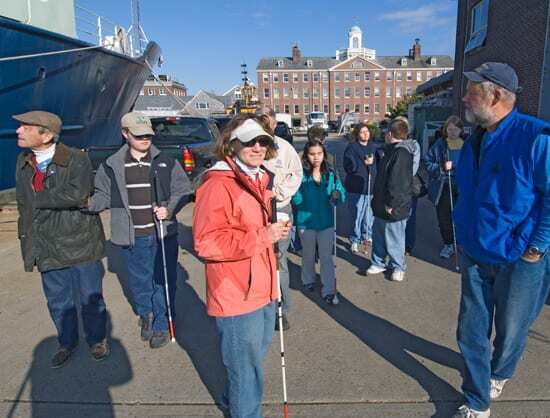 How did your pilot outreach project you developed with Perkins School for the Blind come about? As part of scientists’ proposals to get research funding from the National Science Foundation, scientists are trying to find an outreach activity that we feel particularly qualified for. I thought, “Well, I enjoy working with school kids, and I have a vision impairment. Maybe I can do something with visually impaired students.” I knew about Perkins School, near Boston, and e-mailed, asking if Perkins would be interested in doing something with me, and gave them some ideas. Perkins’ president, Steven Rothstein, put me in touch with their science teachers, and the project snowballed. Perkins School has more than 200 residential and day students from 5 to 22 years old. How will they be involved while you are at sea? This pilot program primarily involves Perkins high school students in the science classes. With WHOI Communications and technical staff, and in consultation with Perkins science teachers, I have developed a Web site, called OceanInsight, for Perkins students. They’ll be in communication with the ship on a daily basis to find out how the project is going and what shipboard life is like. Perkins students have also visited WHOI and have designed some simple experiments for me and their science teacher, Kate Fraser, who will be along on the cruise. These will give them a feel for measurements in different places. It can be difficult for students who have never seen a map, visually, to understand that places might have different environments—cold or warm. After the cruise, students will follow the floats’ progress on the Web site, and I’ll interact with them by e-mail and on visits to the school. What would you like this program to achieve? A main goal of this outreach is to communicate the excitement of science in general, and earth science in particular, to Perkins students—that there is an area of exciting, interesting topics that have a large impact on human life and the life of planet Earth, namely climate. Also, as citizens of the world, they’ll be responsible for helping make sure the environment remains intact and livable. They’ll be voting for politicians. It will help if every citizen has an appreciation of the cogs and wheels that make Earth function. Another goal is to be a role model and show students with vision impairment that I have a successful career that I like, and they, too, could achieve similar aspirations. But if science is not their first love, as it is for me, it would be great if they could find something in life, an avocation that they really are interested in and feel passionate about. Because in achieving something meaningful to themselves, they’ll have some extra challenges, and they’ll need extra motivation and energy. The National Science Foundation is supporting Amy Bower’s research on warm eddies in the Labrador Sea. 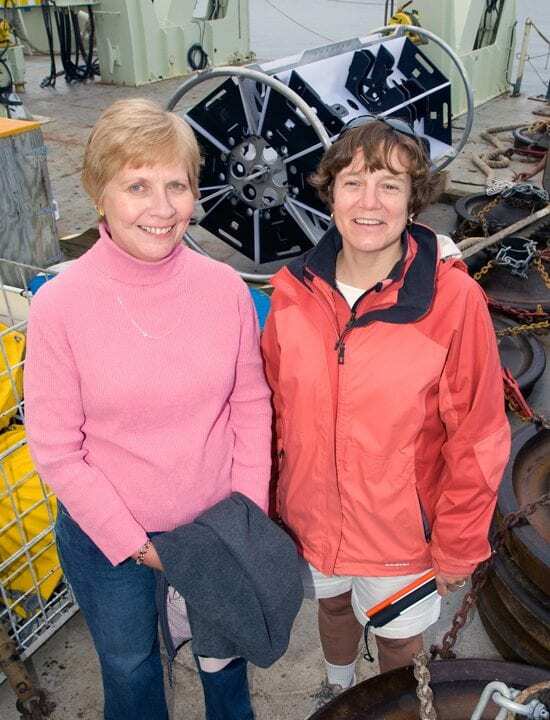 The WHOI “Support for NSF ‘Broader Impacts’ Actvities” program helped support Bower’s pilot outreach program with Perkins School for the Blind. 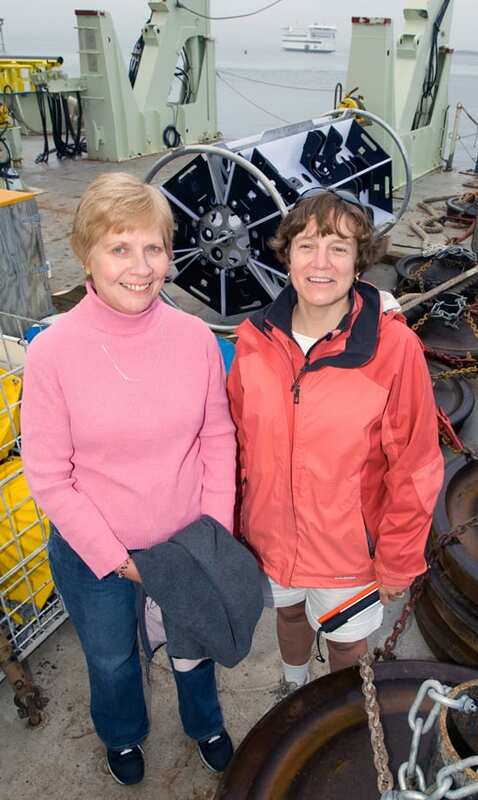 Amy Bower (right) and Katrina Fraser, science teacher at Perkins School for the Blind, on the Knorr's deck, prepare for the seven-day trip to install a mooring in the Labrador Sea.